There are times when the best way to deal with a garden problem area is to build something, not just grow something. Last year we went big on this concept by building a garage/workshop and also ended up with more usable gardening space. Here's the new garage I've shown when posting about the new landscaping along the driveway. In January 2011 we began a long-planned project to construct a garage/workshop in an underutilized side yard. In celebration of the first anniversary of completing the project I'm sharing some of the planning and construction process. The original driveway ended at the double gate and the yard beyond was an eyesore. Here's a view of the area from the roof of the house. A rocky south-facing slope in direct sun most of the day, it was the least inviting spot in the yard making it the perfect spot to build a garage/workshop to handle the overflow from our ever growing list of DIY projects. In addition to the functional requirements, a top priority was that the new construction should look like the house which is "Shed" style. We based the plans on the New England saltbox because it provided flexible space and similar lines to the house. We also decided to go with a wide one-car garage instead of a full two-car in order to leave some gardening space between the house and garage. While most projects around here are DIY, a new garage is not something we would construct by ourselves. We both have extensive experience in construction and project management so we acted as our own contractor on the project and subbed everything else out. After developing our plans we hired an engineer to design the foundation as required by the city. Once the engineering drawings were approved and the permits acquired, we were ready to go. The foundation contractor dropped off really cool equipment the first day. The crew unearthed this huge stone which they moved into place for us to use as a bench facing the creek. It's roughly 4'x3' and we estimate it weighs at least 400 lbs. We had about five minutes to decide and no changing our minds now. The rock bench will be incorporated into a low wall and garden under the trees. In the background you can see where some of that top soil ended up and the beginnings of a new garden between the house and garage. After the forms were prepared, we had big cement trucks in the driveway too. We did have to trim a few secondary tree limbs from the beautiful live oak to the right, fortunately the largest limb across the drive remained untouched. Finally the roof went up, the attic is large enough for lots of storage and we ran water lines if someone wants to convert it to living space in the future. A view from the side, the building steps down the hill with the workshop on the the back separate from the garage. The space on the second level can be used as a studio when I have messy projects. Wrapped and ready for the stone exterior, we had a rare snow delay. It was cold too, the temperature stayed below freezing for three days. The construction crews I worked with in Boston would have thought this was great weather to work in, here in San Antonio they took a few days off. After the snow melted and the weather warmed up we were ready to get back on track. Project Topsoil is done! I'd do a victory dance if I felt like dancing. We did it all ourselves and finished around 3:00 this afternoon in just over 72 hours. You might not understand getting excited about a dump truck of dirt arriving. But with our 80% rock soil called caliche here in north San Antonio, dirt is an important commodity. Somewhat like the movie "Waterworld", if you know what I mean. This load of sandy loam topsoil will keep us busy the next few days. Most of my gardening is in raised beds and I was running of places to plant so we ordered this topsoil two weeks ago. Then it began to rain and rain so they couldn't deliver it until yesterday. The first time in two years rain could have caused such a long delay. Finally, this big dump truck showed up yesterday. Yippee! Our driveway usually seems too big until we need to fit in a dump truck. That's my husband making sure the truck misses the power lines and everything else. During college summers he worked as a railroad brakeman -- A skill that still comes in handy from time to time. He even checked to make sure the truck was empty. And in his spare time sticks his head into alligator mouths. Whooooaaaa. "Yep, looks empty to me." Now we just need to move that big pile around to the new raised beds in the back yard. Twenty four hours later the pile is going down....slowly. Soon I'll have plenty of new planting beds to show you. Today's choice for the ABC's of my garden is this gross looking Fuligo Septica or Dog Vomit Slime Mold. Ewwwww. I didn't make this up it's really named after dog puke. It was even "fungus of the month" on this site. It appeared in the mulch out front just after the recent rains quit. When I sat down to research it and saw the words "Dog Vomit Slime Mold" pop up, I was pretty sure I had found a match because that's exactly how it looks. The good news is that we've had enough rain this year to grow things like mold and fungus. Better than the drought of 2011, which I hope we will remember as the worst in Texas history. Gardening isn't always about the pretty pictures. Just had to share. The ABC's of plants in my garden continues with Elaeagnus. Yes, that Elaeagnus, the one commonly known as Russian Olive and sometimes derisively referred to as "Ugly Agnes". This plant not only serves an important function in my front yard, it does so beautifully. Elaeagnus is the plant with the deep green leaves in the midst of the trees. Our house isn't usually a waterfront property, but the view changes quickly when the rains come. During a rain the normally dry creek can become a raging torrent and a visually interesting part of our landscape. It's certainly nice to relax on the deck with a borrowed view of the creek and then there are rainy days like today. The creek does show on maps as a "seasonal creek" though it's so small it doesn't have a name. Around here that means it only has water when it rains enough, usually more than one inch in a single day. On those days we enjoy our waterfront property. We've had so much rain the ground is saturated and fresh rain is more likely to run off into the creek as it did this morning. Rain here is welcome because it also means the aquifer is recharging after nearly two years of drought. Excess water from our creek flows into Salado Creek, the San Antonio River and eventually to San Antonio Bay near The Aransas National Wildlife Refuge on the Gulf of Mexico where the famous whooping cranes spend their winter. ...and a typical morning view. When it's dry the creek provides a nice view from the house and is the source of food and shelter for the wildlife we enjoy in our yard. The creek spreads out downhill away from the house and we're high enough that flooding is not a concern. We've even seen a flash flood in dry weather when it rained just north of us. It all makes for an interesting and changing feature in the landscape. Newly emerging spring foliage is the focus for this February 2012 Foliage Follow-Up post hosted by Pam at Digging on the 16th each month. 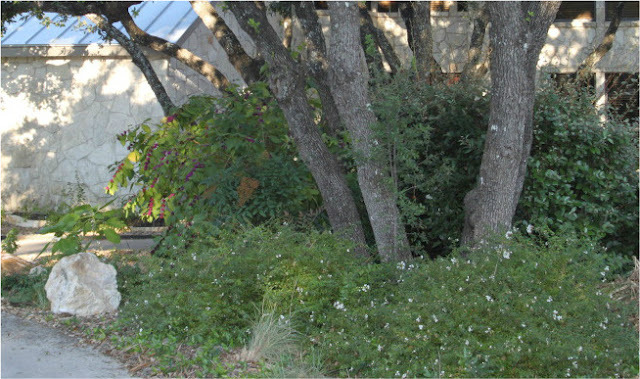 Join Pam and other bloggers from around the world as we show off the foliage in our gardens. Spring arrives early here in south Texas. While our winter was mild overall we had a freeze back in the late fall that knocked back many perennials. With our recent warm weather, the foliage on those plants is emerging and perennials that didn't die back completely are showing new spring growth. Salvia Madrensis is a shade loving favorite that blooms only in the fall. I'm pleased to see all this new growth on a first-year plant meaning I can probably divide it this year. The newest addition to our growing cactus collection is this Golden Barrel (Echinocactus Grunsonii) purchased as a Valentine's Day gift to ourselves. I was thinking of a rose bush, but this golden beauty was too nice to pass up. Of course I'm not the only girl around who'd forgo candy and cut flowers in favor of a cactus plant. The cashier oohed and aahed over it and said it was the best looking one she'd seen come through all day. Where did we find this awesome specimen? Wal-mart. Yes, really. Hardy to about 20F, It's rare that we get lower than that so I'm looking forward to adding it to the garden. If it stops raining long enough to get some gardening done. For those who prefer a more traditional Valentine's Day photo, this red Knockout Rose bloomed late last week. And we did watch "As Good as it Gets" (again). It's cold out there today so I'm staying inside and highlighting a new blog here in south Texas. Sam Taylor's focus on birds and birding in Lone Star Birding and Beyond should be very helpful to me as I learn to identify the birds visiting my yard throughout the year. Sam's blog has already helped out with a bit of a mystery. When I went through photos for a post on Curve-Billed Thrashers, I found similar birds looking slightly different. Perhaps the answer is in his post on Estero Llano Grande State Park and one or all of these birds are actually Long-billed Thrashers. Both are found in this area and more study is needed. 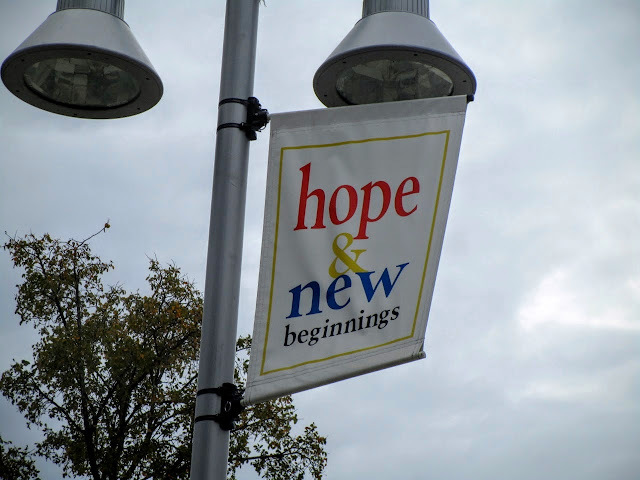 Thanks to Abbey at Down to Earth for bringing this excellent and informative blog to my attention as well. Let's take a break from the Plant ABC's today with a few photos from around the neighborhood. I enjoy reading the posts by Loree at Danger Garden showing yards and gardens from her neighborhood and all around Portland, so I decided to give it a try. Far from "nailing it" on my first few trips around the block with a camera, I didn't like any of the photos at all. That doesn't mean I'm not persistent or will give up easily. Finally, this past Tuesday, I spotted this pretty bloom which I think is an aloe. Today's selection for the ABC's of plants in my garden is Delphinium or Larkspur as it its called here in Texas. These Larkspur flowers are in my friend Kathy's garden where I took this photo when I visited her beautiful garden last spring. Delphiniums are popular summer perennials in colder climates but here in Texas the Larkspur is grown as an annual from seed for spring flowering. In addition to allowing some seed to fall naturally, Kathy collects and sows seeds by hand to ensure this wonderful explosion of blooms. You might think I'm cheating just a bit because this series is supposed to be about plants in my yard. I'm getting to that part. Kathy generously shared her Larkspur seeds with me and I planted them last fall. Here's how they look now....ta daaa! Hmmm, well it will be a while until mine look like hers. So you prefer seeing Kathy's flowers? Thought so. I've learned a lot about gardening in San Antonio from Kathy, most notably that you can grow lots of flowers here. I plan to post more about Kathy's amazing garden transformation along the way too. 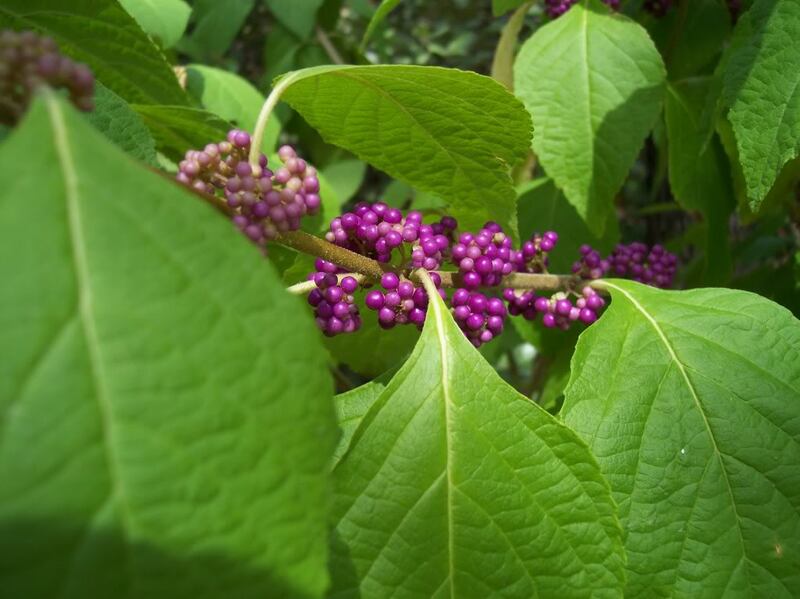 The "ABC's of plants in my garden" series continues with Callicarpa americana which is commonly known as American Beautyberry. That's certainly a good descriptive name for this native plant. 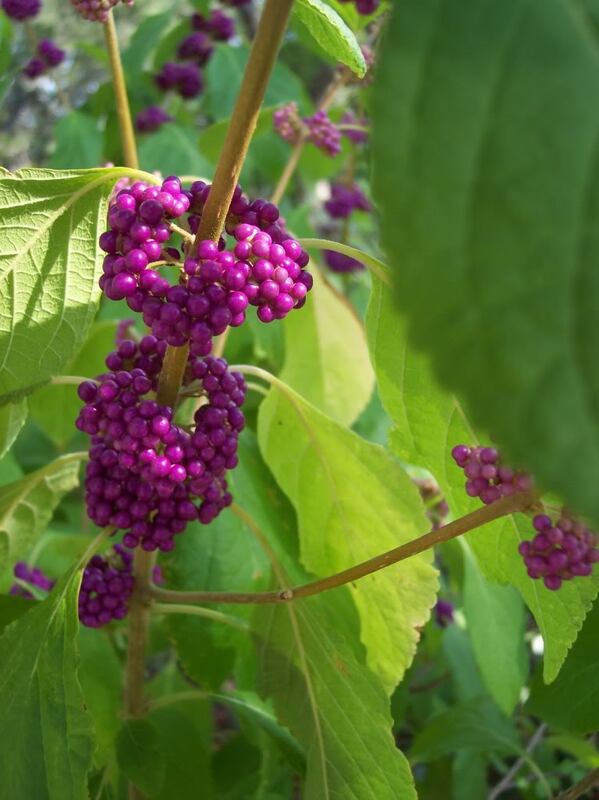 The bright purple berries are strikingly beautiful. When it's blooming the neighbors stop to ask about it. In summer the leafy open pattern provides shade for part-sun plants. They grow best under larger trees and are a lovely welcome along the walk to the shadier part of the garden. These are 15 years old and are about six feet tall now with a few trims over the years. They are very drought tolerant, although in last year's extreme drought they didn't look as good as in the past. The berries form in late summer along the arching branches. The photo below was taken before I began blogging so it isn't the best, but you can just see the berry laden branches in the center near the walk. Callicarpa americana is deciduous and the branches are quite bare after the birds and deer have stripped all the berries so they work best against an evergreen background. Just in case you think we forgot to rake the leaves, the leaves in this area intentionally remain where they fall as a natural plant mulch. As soon as the berries begin to form, the birds, especially Cardinals and Mockingbirds, gather in the nearby shrubs and wait. They test the the berries each day and devour the ripe ones until they are all gone. The berries are safe for humans as well and are used to make jellies. Herb tea is made from the root and the leaves are said to ward off mosquitoes and flies. The "ABC's of plants in my garden" series continues with Brugmansia. 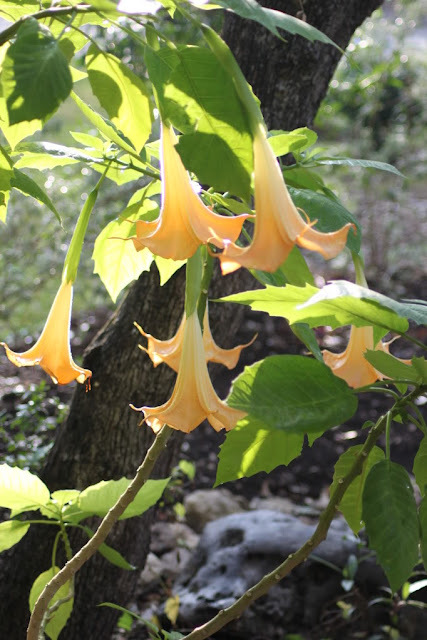 There's something about those large beautiful trumpet blooms emerging from scrawny stems topped with average looking leaves that makes Brugmansia special. That's Dr. Seuss (above) bathed in summer morning light. Recently I noticed the range of plants in my yard just might cover the alphabet. I'm only missing one and plan to add it before we get there. Agave begins my A-Z plant alphabet series. There are several Agaves in the garden and it was hard to pick just one. We just planted this Agave Lophantha 'Splendida' over the weekend giving it plenty of space to offset and spread. Note the two little pups to the left. It was tough not to choose the Abutilon because it looks so spectacular right now. So here's the honorable mention from the A-list. I'll continue posting the alphabet of plants in my garden throughout the year.